La Mesa resident Marla Deck loves the beach. 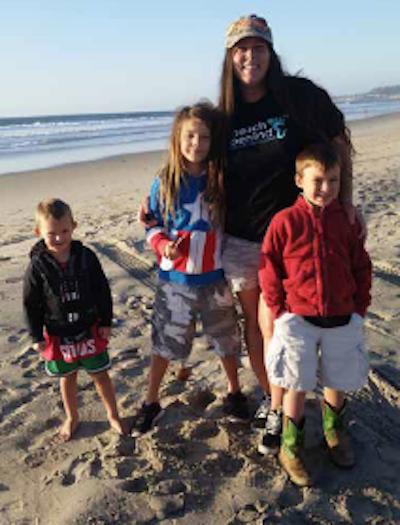 She is a Southern California girl through and through — but the sand that stays on her car and on her kids she could do without. She could also do without the harsh carcinogens found in many body products. Hence her new concoction, patent pending, of Beach Behind: an all-natural powder that works as an easy sand remover. Brush Beach Behind on, brush the sand off (the silky smooth skin left behind is a bonus). The idea started with a short stint in Charleston, South Carolina. Marla and her husband David moved there for his work as an aircraft mechanic with the Department of Defense. Charleston is on the East Coast, and Marla and her three children would frequent the beach Isle of Palms with another mom and her kids. This mother had an interesting way to control the sand flow in her car and children. Fast forward to about a year ago. The Deck family is back in San Diego (the humidity and bugs in Charleston sent them running). They’re attending a surf competition, and the sand-remover idea tickles at Marla’s mind again. “I started doing research — what’s safe or not, what’s available now,” Deck said. She turned her kitchen into a laboratory and her kids into the subjects, mixing different powders together and seeing how the combinations worked after a day at the beach. Finally, Deck hit upon a mixture of a cleansing ingredient and a cooking ingredient that both removed the sand and felt comfortable on the skin. It was still an idea she was only floating until about two months ago, when Deck used the mixture on her feet after another stint at Imperial Beach (Mission Beach is also a favorite of the Deck family). Beach Behind is a family affair. The name is courtesy of David. When putting the bottles together, 8-year-old Jordan holds the funnel, and 5-year-old Jedidiah sticks the label on the bottles. Three-year-old Jonathan is still a little young to help in the process, but his energy keeps everyone in high spirits! Beach Behind is currently available online in unscented, coconut and surf-wax scents. Deck is working with Target and the state beaches (which still have showers turned off) to have it available offline as well. She feels her expertise in business management and aviation planning, photography, and other self-employed commerce has set her up to have great success in the Beach Behind project. “I feel like I’ve been learning character development and business through these other endeavors,” Deck said. 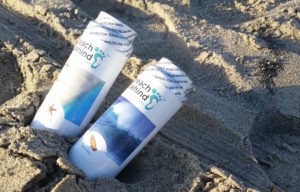 Go to beachbehind.com for more information or to order the product. You can also follow and like Beach Behind on Facebook, Instagram and Twitter.